As the lights, camera and action of WWE's flagship show Monday Night Raw took over the iconic O2 Arena in London, England, we had live coverage for the show throughout the night. This contains spoilers for the 13 April show. 1. Seth Rollins vs. Dolph Ziggler was originally announced, but the champion backed out for Kane to take his place. 2. John Cena defeats Bad News Barrett to retain his United States Title but Rusev attacks the champion with a chain afterwards and their meeting at Extreme Rules will be a "Russian Chain Match"
3. Paige wins a short Battle Royal Match to become the #1 contender to Nikki Bella's Divas Title but Naomi "turns heel" by flattening her after the bout. 4. 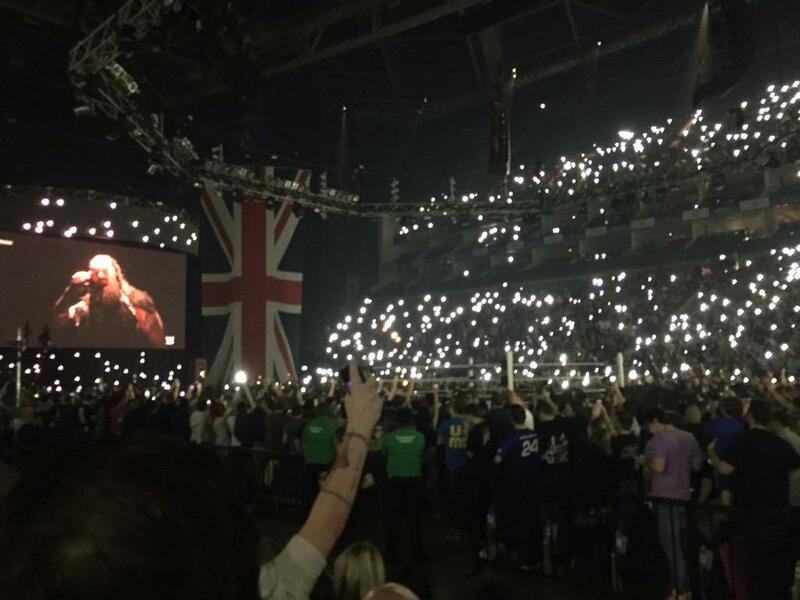 Bray Wyatt cut his usual cryptic promo inside the ring and received a loud pop from the UK fans. 5. Lucha Dragons defeated The Ascension in a quick tag team bout. 6. Booker T interviewed Roman Reigns, but as "Suplex City" chants broke out, Big Show ferociously choke-slammed the Samoan on top of a London taxi and forced him to be stretched out. 7. Cesaro was disqualified in his match with Randy Orton until Kane instated an immediate rematch but a handicap bout. The Viper struck a sensational RKO on Kidd to pick up the win. 8. Dean Ambrose defeated Adam Rose with his finisher move Dirty Deeds in a short match. 9. Seth Rollins told Big Show to get involved with his main event match with Dolph Ziggler; emphasizing his cowardly heel character. The champion also joked saying Jamie Noble should "lie down" and let him get an easy pinfall. Kane said he will do what is "best for business." 10. Stardust defeated Fandango in a short two minute match. 11. Intercontinental Champion Daniel Bryan wound up Kane backstage and told him to be a man, not a stooge. 12. WWE World Heavyweight Champion Seth Rollins defeated Kane after the veteran "turned face". Kane battered Noble & Mercury then chokeslammed a helpless Rollins. 13. Mizdow defeated The Miz with a roll-up in a short match. 14. Ryback defeated Luke Harper via. disqualification after the former Wyatt family member threw the announce table at him until Dean Ambrose stopped Harper by chasing him through the crowd. 15. Naomi gave an apologetic sorry to Paige but then laughed at said "it's about me." 16. Dolph Ziggler defeated Neville in what reports say was a "must see" and "sensational" match. Afterwards, Sheamus flattened Ziggler. 17. Seth Rollins had a sit down promo in the ring. He talked about how he will choose the stipulation for his match against Randy Orton at Extreme Rules and says the RKO will be banned. However, the Apex Predator comes out and says his side of the stipulation is that their match will be inside a steel cage. 18. In the dark main event, Daniel Bryan, Dean Ambrose and Dolph Ziggler defeated Luke Harper, Big Show and Sheamus. Live coverage as WWE Raw emanated from the O2, in London, England.